This oral history, collected in 1921, was annotated in 2007 by Rebecca Tweedell. Click the blue, linked text to view an explanatory note below. Mr. Maine was born in St. Joseph County, February 23, 1841. His parents moved to Howard County when he was about ten years old. When he was a little fellow he was afflicted with “white swelling,” which made him a cripple for life. His father started to ta1e him to Niles, Michigan, to see a specialist, when he was six years old. They went in a big wagon and when they came to the river bridge his father thought it unsafe to cross with the horses and wagon, for the bridge was not a good one, so he left little William in the wagon to watch the horses and he went on for the doctor. Soon William heard a peculiar noise and looking on the river he saw a great object moving down toward the bridge. When it got nearly to the bridge, the bridge moved slowly back and let it pass. then swung back into place. It was a steamboat and a movable bridge, but to his childish mind it was the miraculous. In 1851 they started to move to Howard County in big wagons. They made seven miles the first day. Some difference between that rate and modern vehicles! In four or five days they arrived at his uncle's home. His aunt had a good supper, among other things TOMATO PRESERVES, which he had never eaten before. Tomatoes then grew wild as weeds do now. When they arrived at their new home the first thing they did was to clear a space large enough to build their cabin, then get the logs ready for this one-room house with its big fireplace of stones and its doors and window consisting of quilts. The first night after they moved in it snowed, but they used the “quilt” door and window most of the winter. He had very little chance to go to school, but there was a “Geography school" at night to which his father took him on horseback. Old and young attended this “geography school to see the maps and learn where the different towns. were located. He never saw many Indians; can remember when he was a little fellow seeing them going through the woods and knew by their walk they were not white men. From Howard County he came to Point Isabel where he has lived many years. When asked if life was worth while this dear old man of eighty smiled sweetly and said, “Yes, it has been good,” although he has been a cripple and has worked very hard to get along. Mrs. Nancy Hood-Maines was born in Rush County. Indiana, May 20. 1848. When she was five years old they moved to Liberty township, Grant County. They settled on a farm of 100 acres, only one and a half acres being cleared. Their home was a one-room cabin with a “ground-floor” porch. The first night after their arrival the dogs were driven under the house by wolves, which frightened the children very much for they were not used to wolves. She did not get to go to school very much on account of weak eyes. The games they played at school were ball and “black-man' and the girls would jump the rope, or rather a grapevine. In nice weather she helped pick brush to burn so the land would be ready to cultivate. Corn was planted by hand and covered with a hoe. When a campaign year came around all the young folks would decorate a “float” or big wagon, with bunting and drive for miles to the rallies. When she was ten years old they moved to Green Township, where she yet lives at Point Isabel. These worthy old people work hard at carpet weaving. It is a pitiful sight to see them for Mr. Maines is badly crippled and she almost blind but they are happy and contented. To such there will come “that perfect rest’ which the Lord giveth to his faithful ones. William and Nancy Maine--it may be helpful to note that Maine can also be spelled Main--were a married couple who experienced life in the nineteenth and twentieth centuries. William Maine, the son of John Maine and Sarah Halstead, was born on February 23, 1841, in Warren Township in St. Joseph County (An Illustrated Historical Atlas of St. Joseph Co. Indiana 105). When he was ten years old, he moved with his family to Howard County. He later relocated again to Point Isabel in Grant County. The Maine family had a tradition of attending the Baptist Church and of being members of the Republican Party (Biographical and Genealogical History of Cass, Miami, Howard and Tipton Counties, Indiana 478). William Maine was a laborer throughout his life (1922 Death Records). On June 1, 1871, William Maine married Nancy Hood (Marriage Certificate). They lived together in Point Isabel until his death on October 20, 1922, from nephritis (1922 Death Records), an inflammation of the kidneys (“Introduction”). Nancy Hood was born on May 20, 1848, as the daughter of Garrison Hood and Nancy Brand in Point Isabel (1938 Death Records). The Hood family was affiliated with the Christian church and with the Democratic Party. Nancy’s family had considerable wealth, thanks to Garrison’s education and agricultural prowess. Garrison owned a large farm and supplied his family with the means necessary to live a good life (Whitson 1315). Nancy had eleven brothers and sisters, along with five children of her own: Mary, Clayton, Arlie, Everett, and James. Mrs. Maine outlived her husband by nearly sixteen years, finally dying on February 15, 1938 (Obituaries 95) from myocarditis (1938 Death Records). Myocarditis is an uncommon inflammation of the heart muscle that causes heart failure (Gandelman). Nancy’s myocarditis was caused by arteriosclerosis (1938 Death Records), a hardening of the arteries with fatty material. Sometimes this fatty material can break off and flow through the blood stream into the heart (Weinrauch), which is probably what happened to Nancy. Nancy and William were both laid to rest in the Fork of the Creek Cemetery, also called Union Civil Cemetery, located in Greentown, Indiana (1938 Death Records). They both lived long lives, both living past the age of eighty, and saw many changes in the country around them. The condition that affected Mr. Maine, “white swelling,” is an infection of the bone that can have crippling effects. “White swelling” was contracted when a child became infected with tuberculosis and the tuberculosis spread into the vertebrae and ends of bones. The bacteria that spread into the bones caused swelling in the joints. The skin over these joints was then stretched out, giving it a very white appearance. This is where the name “white swelling” originated. This disease could cause the loss of use of arms or legs because of the swelling in the joints. The term “white swelling” is not used often anymore because tuberculosis is now treated before it can reach the bones and have these crippling effects (Thompson). Transportation styles and speeds changed tremendously with the developments of steamboats, railroads, and automobiles in the United States. Steamboats were the fastest form of travel in the early 1800s, and the rivers were the major highways to facilitate this travel. Robert Fulton invented the first steam powered boat in the United States, the Clermont. This ship made its first trip on August 17, 1807, and reached speeds as high as five miles per hour, which was astonishingly fast for the time. Many other steamboats were constructed in the years following the Clermont’s debut trip. However, steamboat travel was dangerous because steamboats were prone to boiler explosions and Indians were known to attack them. Thus, the steamboat industry began to feel pressure quickly from the railroad industry when this industry began to play a prevalent role in American transportation in the 1830s (“A History of Steamboats”). The earliest railroads were built to connect the river systems and expedite the process of shipping goods and transporting people. However, the railroads quickly spread across the entire country and, by 1869, there was even a Transcontinental Railroad that linked the eastern United States with distant California. The number of miles of railroad tracks in Indiana and the surrounding states increased sevenfold from 1850 to 1890. People no longer needed steamboats for travel because the railway system was faster and was capable of connecting more land than steamboats had been able to connect. Unfortunately for railroad companies, yet another development led to the downfall of the railway system: the development of the automobile (“Rail Transport in the United States”).The first cars, introduced by Daimler in 1885, reached speeds of ten miles per hour, twice as fast as the speeds of the steamboats; but not many people benefited from this invention immediately (“The History of the Automobile”). The first cars in the United States were expensive and owned exclusively by the wealthy. Also, at the time the first cars were introduced, there was not a sufficient road system to facilitate the use of the car. After the First World War, though, the United States began planning and constructing a marked highway system and placing service stations in logical locations to provide gasoline. The great surge by Americans to buy cars began around 1919, when about seven million cars were owned in the United States. Ten years later in 1929, there were twenty-three million cars. These cars could reach top speeds of ninety-eight miles per hour and could be driven on a substantial number of roads, allowing for wide travel from one end of the country to the other (Hinrichs). Each successive invention revolutionized the transportation system in the United States, making movement throughout the country quicker and easier. Schools of the mid and late 1800s in Indiana featured mandatory attendance, permanent buildings, and a wide curriculum. School attendance was finally made mandatory in 1852 with the “Compulsory Attendance Act of 1852,” which required all children, ages eight to fourteen, to go to school at least three months a year. Free public education was also provided in Indiana for the first time in 1852 (“Education”). Most school houses by the 1850s were permanent structures built of stone, brick, or wood. Although this was an improvement upon the little tents or timber facilities in which school had been held before the nineteenth century, most buildings still only contained one small room for all the children. Schools continued to grow in size and structural complexity throughout the late 1800s. The main subjects covered in these schools were reading, writing, arithmetic, and geography. While in school, children also observed strict codes of conduct and politeness. Schools did not only teach the core subjects; they taught socially accepted behaviors and morals. These mandatory, permanent schools of the late 1800s were designed to instruct the entire person, not just the person’s mind (Featherston). Although the name Indiana comes from “Land of the Indians,” the Indian population has never made up a significant percentage of the total population of the state of Indiana. Indiana had been the ancestral home of many Indian tribes, but as soon as the Indiana Territory was opened to settlement, the settlers pushed the Indians out and to the west (“Indiana”). By the mid 1800s, the total population of the state of Indiana was nearly one and a half million, but the Indian population was less than three hundred. The Indians had become so scarce in Indiana that it was rather rare to come across any (“Table 29”). In the 1800s, wolves in Indiana were viewed as a menace. There were even laws that mandated the killing of wolves, especially the killing of “any she wolf within [the hunter’s] power to kill.” This was an attempt to keep the wolves from reproducing and growing in population. Wolves were portrayed as man killers and dangers to society that should be wiped out. Whenever a wolf was sighted, it was killed immediately. This is the reason for the small wolf population in Indiana today (The Searching Wolf). The games school children played in the 1850s were simplistic, yet entertaining. Children did not have high-tech, fancy toys, so they had to make do with whatever inexpensive toys they did have. One of the most common toys was a simple ball. Balls could be used to play a wide variety of games ranging from stoolball, a game in which one team tries to bowl down a stool protected by the other team’s batter, to Annie Over, a game in which a ball is thrown over the top of the school house. Any game that did not require many supplies or money was a winner with the school children (“Recess”). Agriculture was a major business in the 1800s, so the corn planting and harvesting process was of vital importance to many Indiana residents. Corn planted in the 1800s was planted in the late spring in rows that were three or more feet apart. The space between the rows allowed horses or oxen to pass between them so that the corn could be weeded and harvested, which occurred in the fall. Harvesting involved cutting the base of the corn and collecting the plants into shocks. Ears were then gathered from these shocks and taken to a storage facility. The best ears of corn were selected to serve as seed for the next year, while the rest of the corn was stored or sold to provide food for livestock (Landis). Many inhabitants of Indiana depended on the corn crop to provide for their families. 1922 Death Records. Microfilm, reel 2, page 41. Marion Public Library. Marion, Indiana. 1938 Death Records. Microfilm, reel 6, page 3. Marion Public Library. Marion, Indiana. "A History of Steamboats." U.S. Snagboat Montgomery. U.S. Army Corps of Engineers, Mobile District. 5 May 2007 <http://montgomery.sam.usace.army.mil/educational/5thand6th/ahistoryofsteamboats.pdf>. Biographical and Genealogical History of Cass, Miami, Howard and Tipton Counties, Indiana. Vol. 1. Chicago: The Lewis Company, 1898. 477-478. Cornelius, L'Dean, and R. W. Julian, eds. Where Two Rivers Meet: a View of the Past. Logansport: The Cass County Historical Society, 1978. "Education." American Cultural History. Kingwood College. 5 May 2007 <http://kelibrary.ngmcce.edu/19thcentury1850.htm>. Featherston, Peter. "1850s School Life." Sovereign Hill. 2002. Sovereign Hill Education Service. 5 May 2007 <http://www.sovereignhill.com.au/public/DocumentsExchange/schoollife.doc>. Gandelman, Glenn. "Myocarditis." Medline Plus Medical Encyclopedia. 2 May 2007. Medline Plus. 19 May 2007 <http://www.nlm.nih.gov/medlineplus/ency/article/000149.htm>. Hinrichs, Noel. The Pursuit of Excellence. James Cunningham, Son and Co., 1964. Open Book Systems. 5 May 2007 <http://www.obs-us.com/people/karen/cunningham/chapter4.htm>. 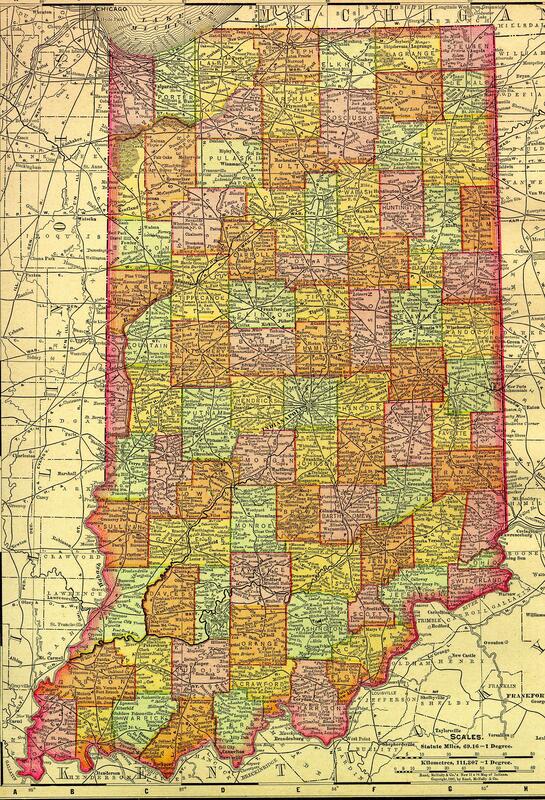 An Illustrated Historical Atlas of St. Joseph Co. Indiana. Chicago: Higgins Belden & Co., 1875. "Indiana in 1895." Map. Ocean Remote Sensing. Johns Hopkins University. 5 May 2007 <http://fermi.jhuapl.edu/states/1895/in_1895.jpg>. "Indiana." WorldAtlas.Com. 5 May 2007 <http://worldatlas.com/webimage/countrys/namerica/usstates/in.htm>. "Introduction." Merck Manual Home Edition. Feb. 2003. Merck. 19 May 2007 <http://www.merck.com/mmhe/sec11/ch144/ch144a.html>. Landis, Leo E. "Indiana Faming: Yesterday and Today." Conner Prairie Living History. Conner Prairie Settlement. 5 May 2007 <http://www.connerprairie.org/HistoryOnline/indag.html>. Marriage Certificate. Microfilm, reel 4, page 403. Marion Public Library. Marion, Indiana. Obituaries: Marion Chronicle and Marion Leader Tribune 1937--1938--1939. Vol. 11. Grant County Genealogy Club, 1998. "Rail Transport in the United States." Wikipedia, the Free Encyclopedia. 5 May 2007 <http://en.wikipedia.org/wiki/Rail_transport_in_the_United_States>. "Receipts, Etc." Godey's_Lady_Book 1863. 5 May 2007 <http://www.uttyl.edu/vbetts/godeys%201863%20July-Dec.htm>. "Recess." ThinkQuest Library. Oracle Thinkquest Education Foundation. 5 May 2007 <http://library.thinkquest.org/J002606?Recess.html>. The Searching Wolf. 4 Sept. 2003. 5 May 2007 <http://www.searchingwolf.com/wscratch.htm>. "Table 29. Indiana-Race and Hispanic Origin 1800 to 1990." Chart. U.S. Census Bureau. 5 May 2007 <http://www.census.gov/population/documentation/twps0056/tab29.xls>. "The History of the Automobile." About.Com. 5 May 2007 <http://inventors.about.com/library/weekly/aacarsgasa.htm>. Thompson, Traci. "White Swelling." 20 Apr. 2000. These annotations were written by Rebecca Tweedell and submitted on June 6, 2007, for Mr. Munn's AP US History class at Marion High School. This page was last modified on 28 June 2007, at 23:18.